Apple armchair, wooden seat composed by two injected foam veneered parts, bleached oak or wengé stained finish. It is possible to combine them differently thanks to an aluminium plate. Square satinized tube frame 15x15 mm. 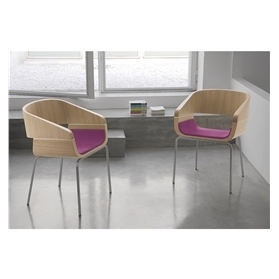 Please contact us to discuss our range of Pedrali seating.